A 2014 flyover of a few of the beautiful sites that can be found on the island of Maui, Hawaii captured in stunning 4K Ultra HD quality video by a DJI Inspire 1 drone. The videographer does a great job piloting the quadcopter and expertly capturing the beauty of coastal cliffs and rock formations, sample of the island’s waterfalls, and the blue ocean that makes Maui famous the world over. 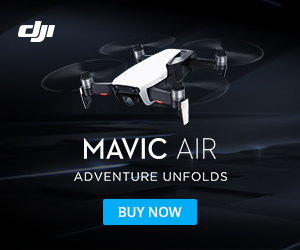 Find out more about the DJI Inspire 1 and some of its features and specifications. A little about some of the water sports people enjoy on the island (according to Wikipedia). Snorkeling is one of the most popular activities on Maui. There are over 30 beaches and bays to snorkel at around the island. One of the most popular sports in Hawaii. Ho’okipa Beach Park is one of Maui’s most famous surfing and windsurfing spots. Other famous or frequently surfed areas include Slaughterhouse Beach, Honolua Bay, Pe’ahi (Jaws), and Fleming Beach. The north side of Maui absorbs the most swell during the winter season and the south and west in the summer time. Due to island blocking, summer south swells tend to be weak and rare.